In 1974, a small band of determined volunteers campaigning for respect and financial recognition for Australian creators started what was to become the Copyright Agency. Among them was Thomas Keneally, Peter Carey, Judith Wright and Frank Moorhouse – and some lesser-known but equally important names: Gus O’Donnell, Peter Banki and David Catterns. The Australian creative arts industry was blossoming in 1974, yet authors’ and artists’ rights weren’t being protected and their work was being copied frequently without their permission. 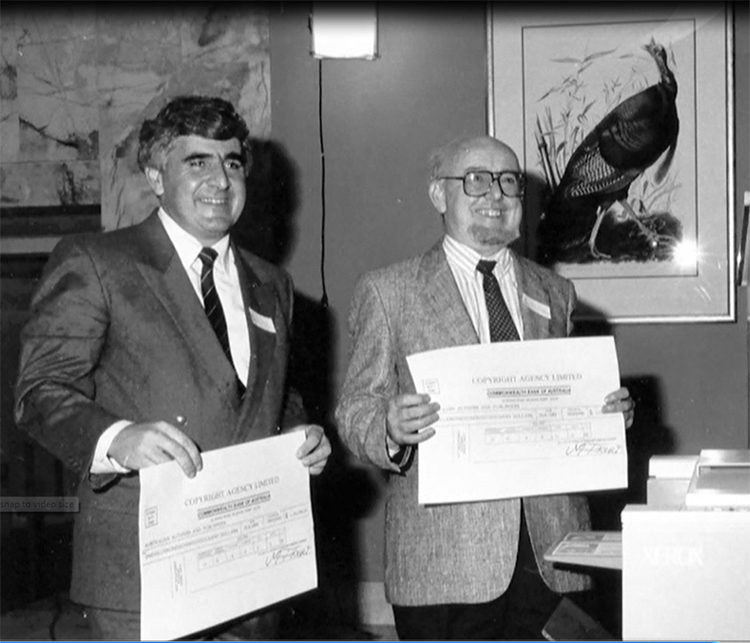 Laurie Muller and Tom Keneally with the first cheque distribution of the Copyright Agency. After a series of legal actions brought over a decade by the Australian Society of Authors’ Gus O’Donnell, with support from Frank Moorhouse and many others, the Copyright Agency (then known as CAL) received its first payment of copyright licensing fees, a cheque for $16.10 in July 1985. In 1986, the agency received a $14,228 payment from Macquarie University – and after that everything changed. Since then, hundreds of millions of dollars have been distributed to Australia’s creative community, providing thousands of people with fair recompense for the copying and sharing of their creative works. More than a billion and a half pages of copyrighted works are copied and shared in Australia’s schools and universities each year. Such copying and electronic sharing is covered by schools and universities copying schemes (statutory licences). Schools pay just under $17 per year per student for copied works. This is less than the cost of many text books, provides about twice the amount of content and is specifically tailored to students’ educational needs.